Signs of Spring in Carlisle PA? Maybe the groundhog was right! It's only February 17th and our daffodils are peeking up through the ground! We planted quite a few crocus last fall too and you can see them trying to find the sunshine. It's a balmy 60 degrees here today - and the forecast is for even warmer temperatures tomorrow. The warm temperatures mean Spring conditions at Roundtop Mountain Resort. I went skiing (yes - I "took a snow day", well at least a few hours) and conditions were absolutely fabulous! 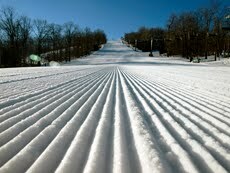 The sun shone from a deep blue sky; Winds were calm; There was lots of snow that had been groomed to perfection! From the top of the mountain I could see 360 degrees - looking over farmland and orchards, tree covered hills and small villages. I could even see the Harrisburg skyline. I realized that in only a few weeks, the orchards will be in bloom and the view will be totally new and fresh! Remember that this weekend is Presidents' Day weekend. Stay with us Sunday night (at 10% off regular rates) and enjoy the skiing at ROundtop!